They came and tried to dazzle us. Some succeed, many did not. Did anyone feel last night was a let down? 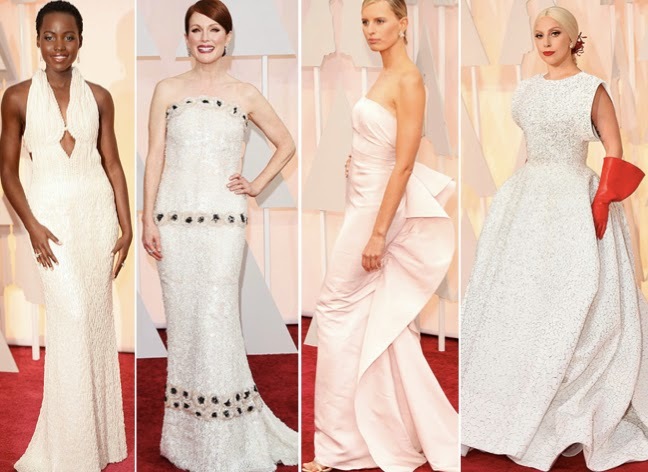 Don't get me wrong, tons of gorgeous gowns, but very few that took a risk and really made a beautiful statement. Of course there were some, so let's start with those ladies. Marion, Emma, and Margot are my top of the Best list. I know that Marion is a wild card with this billowing back, but I love it. One of the few that took a risk and I love her for it. It has a mod feel while also feeling glam. Emma kills in this. Love seeing her in some sparkle and that color is perfect for her. Margot in YSL, that necklace, a red lip. Simple, yet screams Hollywood. These ladies in red are my second runners up. Rosamund stuns in this red. Tailored so well and the cut makes it modern. Dakota also looks fetching in red, this photo does not give this dress justice. Best Dressed Couples? I could almost give Eddie and his wife overall Best Dressed. His wife's dress is amazing. Bahati's dress is beautiful, hair might be a bit severe, but the Levine's look great. Blushing ladies looking pretty: Jennifer Aniston isn't wearing anything earth shattering, but pretty. Keira's will be controversial, but I think it is beautiful. Jennifer comes out in a full movie star gown that so many actual movie stars should have worn. Why is she at these shows again? Gwyneth is wearing the most perfect shade of pink ever. Love this. Heavy metals always look great on the red carpet. Laura could ditch that necklace and hair, but that dress is killer. Rita has done one movie and is looking like an old pro. Love this navy with the gold. Naomi's dress looks terrible here, but on the red carpet this was great (I hate me for saying it, but it is true). Miss Chung is bring it with this gown. So pretty. The color combo of this on Nicole is odd, but I like it. Anna looks a little uncomfortable in this gown, but she is so fun. Miss Hudson is gorgeous in yellow and those earrings. I actually think I hate this on Anna. But then I like it. And then I hate it again. Lupita could have been at the top of the list with this pearl number, but that fitting on top is strange. And that trend continues with Julianne. That middle row of flowers kills this entire dress. Otherwise, it would be SO good. Carolina looking gorg in this ruffled number. And dare I say I like this on Lady Gaga? The matching gloves, hair piece, and lips are horrible, but the dress is really great. This is the category I like to call, I am disappointed. REALLY disappointed. These ladies could do SO much better. They could pick any dress, any dress in the world and this is what they choose? While they all look really pretty, they are all quite boring. Cate's necklace is a redeeming factor, but other than that I really wish they would have made some better choices. And risks! Whoa, Scarlett. I don't think anyone has looked as scary at the Oscars since Gwyneth forgot to wear a bra. She also is officially a bobble head. Eat a cheeseburger. I want to be on Zoe's side so much because this lady just had twins. Twins! She looks amazing, but this dress cannot be saved. The top is so bad. Everything about Jessica's is so bad. The proportions could not be more unflattering and slit makes it even worse. I kind of worship Chloe, but this can't be saved. Too much like upholstery and that band at the top cheapens it. Chrissy has been on the top of the lists the last year, but this entire look is all too much. The slit is way too much and that lipstick is too dark. Felicity, oh how I love her. I just saw The Theory of Everything (amazing) and it breaks my heart to see her as a worst dressed. This dress is swallowing her whole. As are those bangs. These two couple need some help. I love the Carrell's but her dress is a big fat no. And wtf happened to Tim McGraw?! He is five pounds, I think Faith could take him in a fight. Not loving her hair either. And that's it! What were your thoughts??? You know that I love that we don't always agree, that is the fun of it. Obsessed with Keira's! It was my favorite. Great recap! !